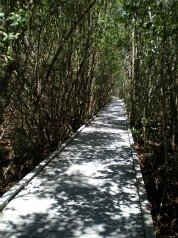 Cape Coral Eco Park has the coolest mangrove forest, walking paths, and kayak rentals. 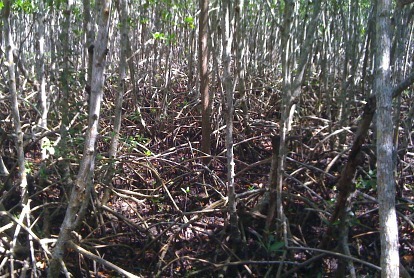 If you've never seen a mangrove forest, you've got to because there is nothing like it! The tops of the trees look similar to forests of deciduous trees that you would normally think of. But, the bottoms of the trees are totally different. The roots of mangroves are above ground and so it seems like the trees have legs and are about to crawl away ........... we think it looks like an alien forest! Eco Park, also known as Four Mile Cove Ecological Park, is one of 39 Cape Coral parks and is right near the Midpoint Bridge, along the Caloosahatchee River. To get there, you have to go north on Del Prado Blvd from Veterans Blvd, past Coralwood Shopping Center. Take a right onto 21st Lane, follow the signs through a residential neighborhood until you get to the park. 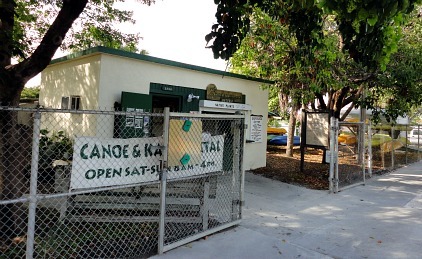 Immediately after you get to the park, the first left takes you to the kayak rentals. You can rent kayaks from October-May on weekends from 8AM-4PM. Trails take you to Four Mile Cove on the Caloosahatchee River, call ahead to reserve at (239)574-7395. 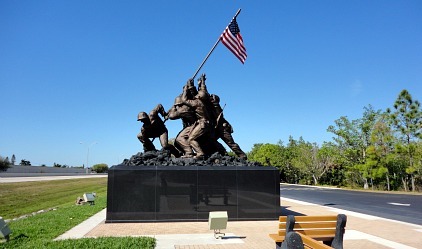 If you continue straight down the road, you will come to a parking lot with a replica of the famous Iwo Jima statue that used to be in Cape Coral's Rose Gardens from the 1960's. A new monument will be built to honor veterans of the Iraqi War of 2003-2011 and fundraising is happening now to make it the first of it's kind in the country. To contribute, go to Cape Coral Iraqi Freedom Monument. This Cape Coral park also has a visitor's center with trail guides and wildlife displays. From the parking lot there are several entrances to a whole new world ....... a mangrove forest Florida wonderland! Nature trails have boardwalks and are mostly shaded. There are areas where you can sit and rest along the path. Markers explain about the different elements of nature that you will encounter along the way. There are two parts of the path that take you to the Caloosahatchee River where you can see birds, snakes and other wildlife from an observation deck on the boardwalk. 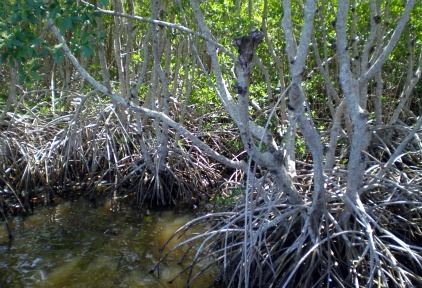 Mangroves are important for Florida's ecology because they protect against erosion and hurricanes. Their root systems slows down tides, waves, and storm surges. These amazing trees also provide a habitat for creatures that live in salty or brackish waters. Learn more about the ecology of estuaries, where fresh and sea water meet, by going to Cape Coral Eco Park.